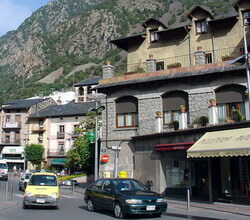 Andorra la Vella is a very attractive destination situated in the east side of the Pyrenees, next to Spain and France. This city is the capital of what is known as the Principality of Andorra and counts with a very peculiar and diverse population since about 45% of its inhabitants are Spanish, 11% are Portuguese, 33% are Andorra, and 7% are French. The main language spoken in Andorra la Vella is Catalan, but many of its inhabitants also speak Castilian, French and Portuguese. It is also interesting to know that the name of this town, Andorra la Vella, means Andorra the Old, and this is due to the fact that it is a very ancient spot which was inhabited since the Christian times. Andorra la Vella has a very picturesque and antique old town, which was were the first settlements of this destination were established. This old town is called Barri Antic, and is characterized by having stoned streets and antique houses mostly constructed with stone as well. This spot can be found between the Placeta del Puial and the Esglesia de Sant Esteve, and is without any doubt one of the main spots tourists should visit while being in Andorra la Vella. The Esglesia de Sant Esteve is a very antique construction and one of the main attractions in Andorra la Vella. This church was built in the 11th century in Romanesque style, and by visiting, tourists could observe some peculiar paintings exhibited in its interior. Most of these paintings are even more antique than the construction itself since they date from the 13th century. One of the most interesting constructions visitors can meet in Andorra la Vella is the Casa de la Vall, or House of the Valley. The Casa de la Vall is the house of the Andorran parliament, and has received them since the year 1703. Before that, this construction which dates from 1580 was inhabited by a family. This building is very interesting for a variety of reasons, among which we can remark its antiquity, its architecture, its interior design, and its history. About the Author - Jakob Jelling is the founder of Eurotomic.com. Please visit www.eurotomic.com/spain.php if you're planning a trip to Spain.